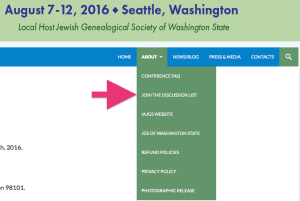 Discussion Lists for IAJGS conferences have been wonderful venues for questions and exchanges of information about up-coming conferences. The Discussion List for the 2016 Seattle IAJGS is now operational and available for subscription. Be sure to read the Discussion List Guidelines before you subscribe. Any messages posted will be publicly viewable. You may subscribe in either non-digest or digest mode. In non-digest mode you will receive new messages individually as they are posted. In digest mode, messages will be sent to you in one batch each day. This year conference volunteers will review messages sent to the list before deciding to post them. This will ensure that non-conference-related messages and spam will not be posted, that civility will be maintained, and that questions best answered by the conference planning team will be answered in a timely manner. Before sending a message to the list, please check the conference FAQs (Frequently Asked Questions) to be sure your question has not already been answered. As plans for the conference gel, we will expand the FAQs to include additional topics such as conference registration and hotel information. 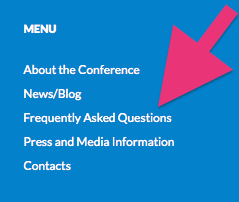 You may access the FAQs at the link, above, or scroll to the bottom of the conference webpage and locate the blue section and locate and click on Frequently Asked Questions.